SocuSoft Web Video Player is an easy-to-use powerful application for creating web videos with an embedded player which can be placed directly into the webpage. As an all-in-one player, SocuSoft Web Video Player is integrated with several key components: flash video (FLV) player, video converter and web video generator. You can watch FLV videos in the mode of "Themes" of this program or using the integrated component -- video converter. 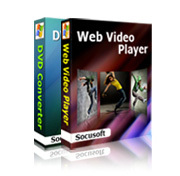 The integrated video converter is a powerful tool for playing and converting videos. It accepts video files in a variety of formats, helping you to convert videos to FLV format for web video player. The component of web video generator makes it easy to create web videos to be watched on a website. A video player is embedded with the video into the webpage. SocuSoft DVD Converter is an excellent tool that makes it easy for you to convert DVD movies supporting all popular video formats. As a DVD Converter, it can convert almost all video formats including MPEG, DVD, WMV, RM, RMVB, MOV, VOB, DivX, XviD, AVI to MPEG-4 or MPEG movie formats for MP4 player, iPod, smart phone or other media players. You can even capture video files from DV through this software. It customizes relevant output formats for iPod, iPhone, PSP, mobile phone (e.g. Nokia N-series), Apple TV and Microsoft Zune. You may input single video or batch clips to be published onto the same webpage. The integrated converter allows you to convert video files of different formats such as MOV, WMV, FLV, MPEG-4, MPG, RM, RMVB, AVI, VOB, ASF, DV, 3GP, M1V and M2V into FLV or other formats. The conversion speed and quality are perfect. You may choose the video clip and click the shortcut button "Edit" to edit video file properties in the mode of "(1) Video". You can change the title or the thumbnail image of the video, or add description and target URL such as company introduction, website URL and advertisement links. Video player templates of different styles are available in the mode of "(2) Themes". It is very convenient to preview the theme. Only one click is needed to embed the player to your video to preview. You may select one that matches the style of your website or blog. The program provides advanced users with rich parameter settings for web videos. Go to "Customize Properties" at the bottom right window in the mode of "(2) Themes". There are basic properties, panel properties, video properties, etc. You may change movie size, play mode, background color and so on. The web video player supports show/hide of video play list. You can show a list of video files in one player. All video players have such features as playback, time display, volume control and full screen toggle buttons. The program allows you easily to publish your web video with an embedded player to be placed on your website, e-store or blog with only three simple steps. It can be placed directly into your webpage and played online. It is rather convenient to get the output files containing codes which include html, xml, swf and relevant folders for you to be edited by Dreamweaver or FrontPage. TV connected to DVD/VCD player for burning purpose.